Venue: W Shanghai - The Bund, No.66 Lvshun Road, Shanghai 200080, China. 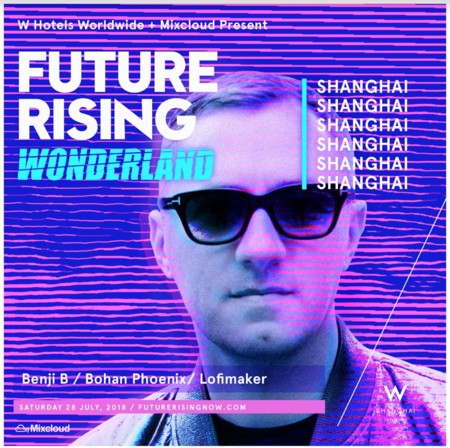 On Saturday July 28th, Benji B joins an all star cast at Mixcloud's Future Rising event at W Shanghai-The Bund, a trend-setting hotel chain in Shanghai's beating heart. Future Rising is a platform that identifies, cultivates and celebrates emerging artists and creative leaders of tomorrow. In the Shanghai edition of Future Rising, radio superstar and producer Benji B will collaborate with Future Rising Chinese MC Bohan Phoenix to create an exclusive two track EP and documentary. This edition partners with renowned culture collective and club promoter YETI OUT, featuring an exceptional evening of music and talks, to explore the local creative scene and more. To celebrate and premiere this project the artists will showcase the new collaboration at an exclusive suite session. Hosted by a Mixcloud moderator, Benji B and Bohan Phoenix will sit down to show off their newly created tracks for the first time, live, before talking about their new music and how the theme of Wonderland inspired their work. Following on from the session, the audience will be treated with an exclusive live performance from Bohan Phoenix followed by a not-to-be-missed set from Benji B at W's Wet Bar. Benji B is a unique DJ, renowned for his unprecedented selections and distinctive style. Seamlessly drawing from several genres at once; in a single set you'll hear brand new dubs and classic tunes side by side, the most cutting edge House, Dubstep and Funky tracks, Disco/Soul and Boogie. Now a BBC Radio 1 DJ, Benji B's success continues to grow. Bohan Phoenix was born in Hubei, China and moved to the United States when he was eleven. Not until Bohan took ownership of his heritage and put that into his work was he able to find the kind of success he could get excited about. Now, the blend of cultures that makes up Bohan's personality and music is putting him at the forefront of the Chinese hip-hop scene. Artists / Speakers: Benji B, Bohan Phoenix.